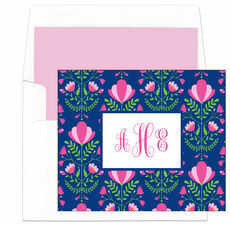 Sample shown using typestyles BNDB and EOOD, Shocking Pink ink and Shocking Pink Stripes envelope linings. Set of foldover note cards with blank white envelopes. Card size is 5.5" x 4.25". Flat printed in ink color and typestyles of your choice. Printed return address and optional envelope linings available. Positioning only as shown.